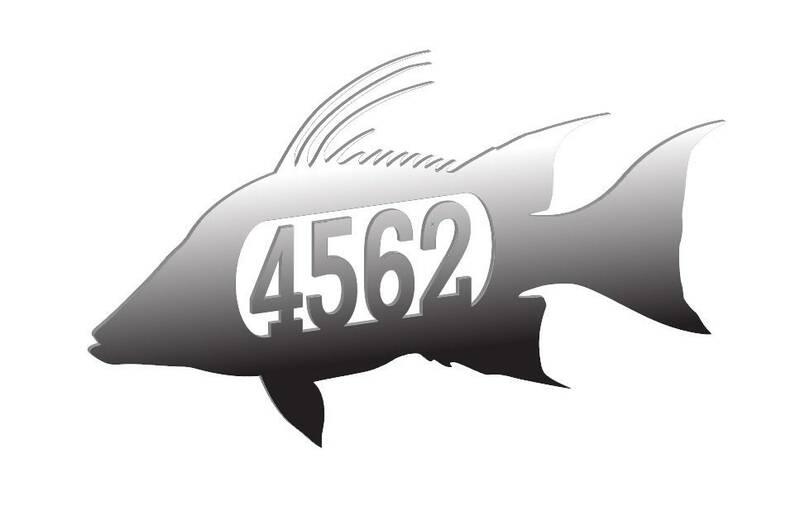 Custom hogfish address sign for your residence/business. Hogfish is approx 24" wide and 14" tall, cut from 1/8" aluminum. House/address numbers are 3.75" tall. Number shown is an example only. To order simply purchase the piece and add the desired number to the notes section. Since each one is made to order we can further customize the piece at your request. Seaside metal uses aluminum instead of steel to ensure that they never rust. We coat both sides of the piece with a baked on powder coat which is UV stable so it is safe to be displayed outdoors. Finally, and this might be the best part, our turn around time from order to shipment is a week or less. Options at no cost are hand grinding and clear powder (as shown) or any solid tone powder that we have in stock (black, bronze, pewter, etc). Custom sizes, colors, variations, and materials are all available, just ask!